Both Republicans and Democrats have condemned her for 'anti-Semitic' comments. Democratic Rep. Ilhan Omar, the freshman congresswoman President Donald Trump and other top Republicans say should be removed from the House Foreign Affairs Committee because of her "anti-Semitic" comments, engaged in a fiery exchange Wednesday with a Trump administration official over U.S. policy in Central America. Omar, one the first Muslim women in Congress, first came under fire Sunday when she tweeted that the GOP and lawmakers who support Israel do so because of donations from pro-Israel lobbying groups, specifically calling out the American Israel Public Affairs Committee, or AIPAC, which has spent millions lobbying for pro-Israel legislation and sponsors trips to Israel for members of Congress. 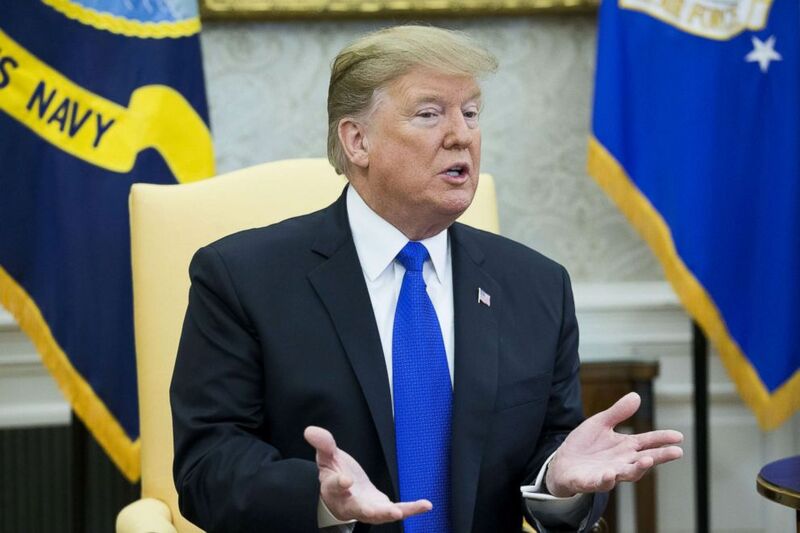 Since then, after even House Speaker Nancy Pelosi condemned her comments and Omar apologized, Trump has repeatedly called on her to either resign from Congress or "at least the committee," he said, because it deals with U.S. policy toward Israel. Vice President Mike Pence added that "those who engage in anti-Semitic tropes should not just be denounced, they should face consequences for their words." Conservative commentators have also tried to hold Omar's feet to the fire. Her exchange Wednesday with special envoy for Venezuela Elliott Abrams illuminated the rising tensions between Omar and the GOP. It began when Omar raised Abrams' conviction for lying about the Iran-Contra affair in the 1980s, for which he was later pardoned, and said she "fail[ed] to understand why members of this committee or the American people should find any testimony that [he] give today to be truthful." The exchange escalated as Omar pressed him on the human rights standards of the U.S. military in Central America and at one point, Abrams called Omar's questioning "ridiculous" and said he wouldn't respond to a "personal attack which is not a question." Meanwhile, pushback on Omar's comments and denouncing anti-Semitism has turned into a Republican rallying cry and they accuse Democrats of hypocrisy, saying the GOP removed Rep. Steve King from congressional committees after the Iowa Republican's latest comments about white nationalism, which critics called racist. (Michael Reynolds/Pool/Getty Images) President Donald J. Trump speaks during a meeting in the Oval Office, Feb. 13, 2019, in Washington, DC. "At a minimum, she ought to be forced off that committee," said Republican Rep. Ted Yoho, a fellow member of the Foreign Affairs committee, speaking on Fox News Wednesday in one of many segments focused on the controversy. "Look at the hypocrisy when Steve King said the things he said, the Democrats were up in arms." "The weight of her words carry a lot of weight, not just here in Congress and Minnesota, but around the world. For a member of Congress to talk like that is unacceptable," Yoho said. Omar responded to the president's criticism Tuesday with a tweet, pointing to the power of words. "You have trafficked in hate your whole life—against Jews, Muslims, Indigenous, immigrants, black people and more. I learned from people impacted by my words. When will you?" she tweeted. Democratic leaders, including Pelosi, have rebuked Omar for her initial comments, saying her "use of anti-Semitic tropes and prejudicial accusations about Israel’s supporters" was "deeply offensive." Even so, Pelosi on Wednesday defended Omar's apology. "A new member of Congress has apologized … it took them, what, 13 years, to notice Steve King?" she said. Late Wednesday, the full House voted to denounce anti-Semitism in a Republican-led measure, in a GOP move meant as an implicit rebuke to Omar. Rep. Hakeem Jeffries, chairman of the House Democratic Caucus, when asked about GOP demands about Omar, said the caucus is "strongly pro-Israel and will continue to be so in the future." Sen. Amy Klobuchar, the Democrat from Minnesota running for president in 2020, said she was glad Omar apologized. "I'm glad she apologized. That was the right thing to do. There is just no room for those kinds of words," Klobuchar said in an interview on Fox News Tuesday night. "I think Israel is our beacon of democracy. I've been a strong supporter of Israel and that will never change." Omar has refused to discuss the controversy surrounding her tweets with reporters beyond her statement sent out on Monday. But the Minnesota Democrat has continued to back-channel with Jewish groups in Washington, and Democratic members, as she seeks to clean up some of the controversy. Rep. Josh Gottheimer, D-N.J., told ABC News his staff is in communication with Omar's office about setting up a meeting for lawmakers. "I met with her face-to-face," Rep. Dean Phillips, another Minnesota Democrat, who is Jewish, said of Omar. "It was a very productive conversation." "I’m hopeful that she’s having those conversations" Phillips said. "That was my request from her, and her commitment was to listen a little bit more and learn and we have a collective, mutual responsibility to do that with one another. And to that extent, I hope it opens up some doors to do so." Omar has also been in touch with the leadership of J Street, a liberal group advocating for peace between Israel and Palestine, and Bend the Arc, another progressive Jewish group that organizes against the Trump agenda. Chelsea Clinton, daughter of former presidential candidate Hillary Clinton and former President Bill Clinton, quickly condemned Omar for her comments over the weekend. On Tuesday evening, in response to Pence's tweet, she joined Democrats in calls to move on. Clinton highlighted a point many Democrats are leaning on in defending Omar -- that similar calls for leaders to recognize the power of words have previously been pointed at Trump. "President Trump, a far more powerful person in Washington, has never apologized for his embrace of white nationalism & anti-Semitic & Islamophobic hate," Clinton tweeted.